In this post, I take a closer look at how U.S. states compare in their energy consumption, spending, and prices. Using data from the U.S. Energy Information Administration’s Annual Energy Review, I created a dashboard to visualize the patterns, and I put together an accompanying slide deck that you can download at the bottom of this post. 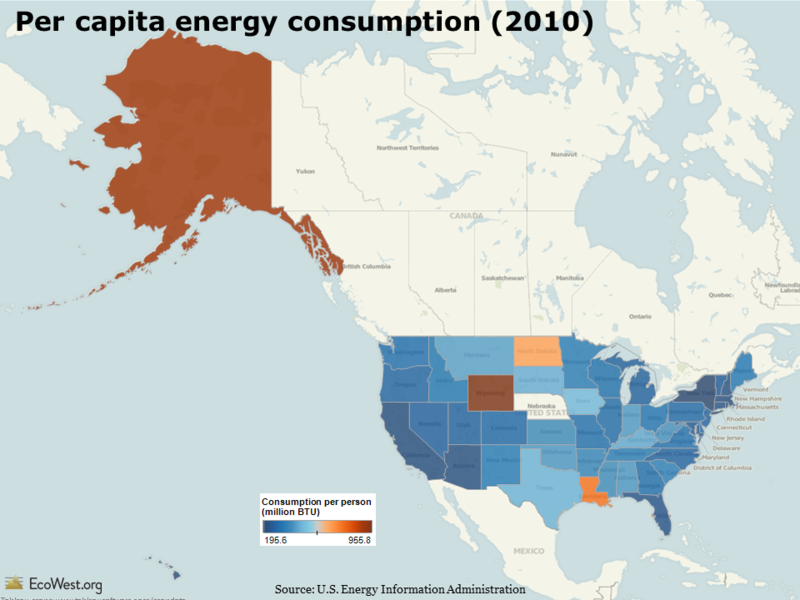 The map below (click to enlarge) illustrates per capita energy consumption in 2010. Four states—Alaska, Wyoming, North Dakota, and Louisiana—stick out. This group of states shares two things in common. First, all have relatively low populations, so the denominator in the per capita calculation is small. Second, all four states are major energy producers. Because it generally takes a lot of energy to extract, produce, and distribute fossil energy sources, these states also rank high on consumption. The chart below adds two more dimensions: prices and per capita spending. The bars are shaded green according to the total energy consumption in the state. I’ve sorted the states alphabetically, but on the dashboard you can order them by any of these variables. 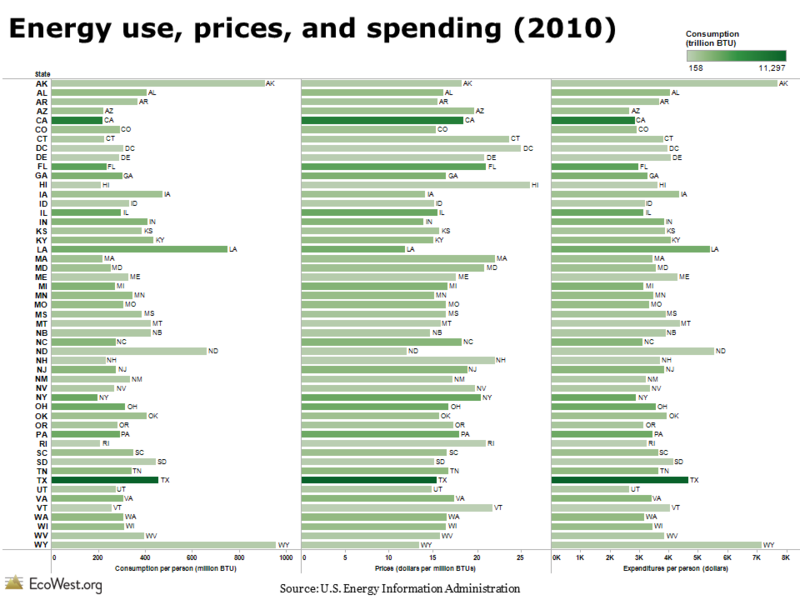 I was curious whether there was any relationship between energy consumption and prices. Economics 101 suggests higher prices could mean lower consumption. 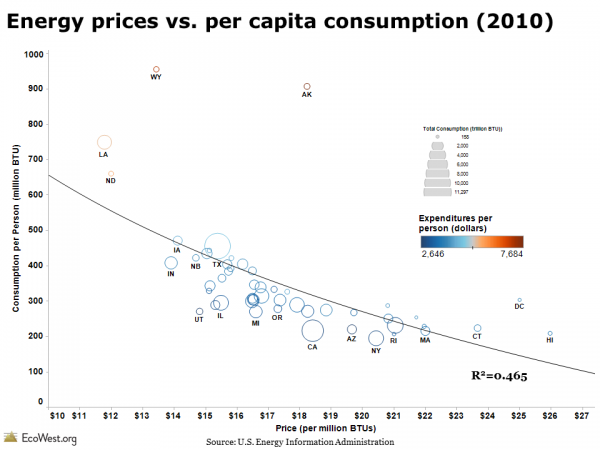 The scatter plot below shows that there is, in fact, an inverse relationship between energy prices and use. I’ve sized the circles according to the total energy consumed in the state and colored them according to per capita energy expenditures. 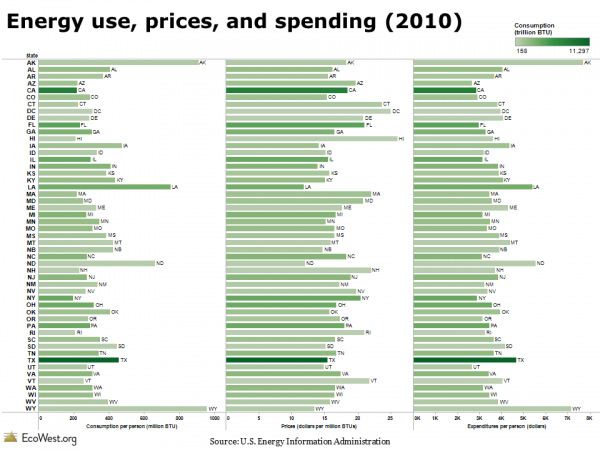 The spread in energy consumption and prices across the 50 states is very wide. Energy prices in Hawaii and some Northeast states are double, or nearly so, the costs in Louisiana and North Dakota. Per capita consumption in New York and California is less than one-fourth the use in Alaska and Wyoming. Once again, the four energy-producing states are outliers. Leaving aside Alaska, where prices for many commodities are high, these states have the lowest energy prices. I repeated the analysis by excluding the four states and the R2 value increased from 0.465 to 0.566, indicating a stronger correlation between price and consumption. But correlation is not causation! Other factors, such as the local climate and travel patterns in a state, may be more important variables. 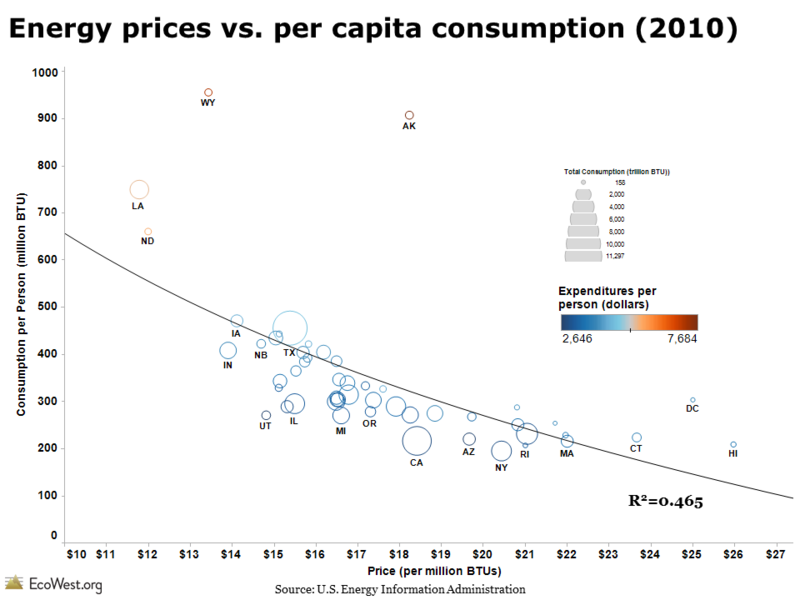 Several of the states with the most expensive energy prices and lowest energy consumption are in the Northeast (e.g., Connecticut, Rhode Island, Massachusetts, New York). Prices tend to be higher in this urbanized region, which has a large population, extensive mass transit, and fewer vehicle-miles traveled. In other words, the high cost of gasoline in Manhattan is probably not the main reason why its residents drive less. In a future post, I’ll analyze state-level data on carbon dioxide emissions. The energy dashboard is based on data from the U.S. Energy Information Administration’s Annual Energy Review, specifically this table. With drought gripping much of the West, 2013 could be another active wildfire season in the region. There’s already a fast-moving blaze in Southern California that is threatening hundreds of homes. To track the severity of wildfires, I’ve created a dashboard on this page that summarizes recent trends, both nationally and in the West. The screenshot below (click to enlarge) shows how the number of fires, acres burned, and average size of fires has changed since 1987. While the number of fires has remained relatively constant, the acreage burned and average size have been exhibiting an upward trend. In our wildfire PowerPoint deck, we explain why Western wildfires are generally getting bigger and more destructive. Although fire is a natural part of many Western forests, woodlands, and grasslands, we’re now suffering from the legacy of misguided fire suppression in ecosystems where frequent, low-intensity blazes once consumed excess fuel. A 2006 paper in Science, which found that “large wildfire activity increased suddenly and markedly in the mid-1980s,” argued that warming temperatures and an earlier spring snowmelt were the biggest drivers. 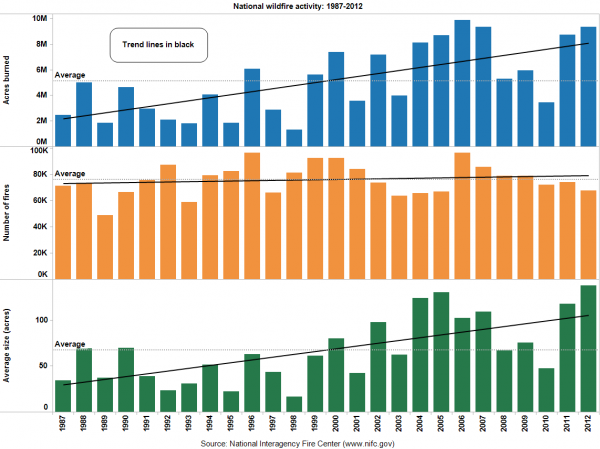 If you examine the yearly statistics, however, you’ll see that wildfire activity varies greatly from season to season. A couple of enormous blazes can really skew the national totals, while in some years benign weather keeps a damper on wildfires. You can see that variability even more clearly by just looking at the Western states in this screen shot below (click to enlarge). In Idaho, for example, very few acres burned in 2004, but 2007 was especially active. Some years, such as 2004 and 2010, were relatively tame across the entire West. In others, certain regions were especially hard hit, such as Arizona and New Mexico in 2011. But then at other times, such as 2012, nearly all states reported lots of acres burned. The dashboard also allows you to examine wildfire activity by different regions. With all of the graphics, you can include/exclude variables, sort the data, and create downloadable images and PDFs. I’ve used this same data to create some PowerPoint slides, which are available in this video below and through download links at the bottom of the post. 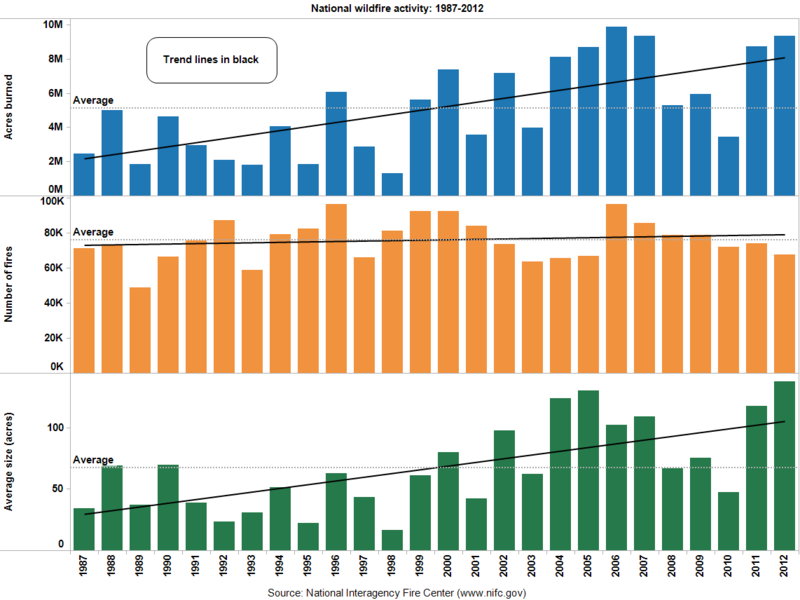 Tracking trends in wildfire activity from EcoWest on Vimeo. In the coming weeks, I’ll be rolling out more slides and dashboards for monitoring the wildfire issue, including ignition sources, fuels treatment, and wildfire suppression. Compared to other issues, I’ve found that tracking wildfires is relatively straightforward. Almost all of the key data is managed by the National Interagency Fire Center in Boise, Idaho. During the fire season, NIFC provides detailed information on blazes in progress, but the center also compiles statistics and produces an annual report that summarizes the preceding year. Here’s the 2012 summary, for example. Aside from the Pacific Northwest, nearly all of the land west of the 100th Meridian is currently drier than normal. 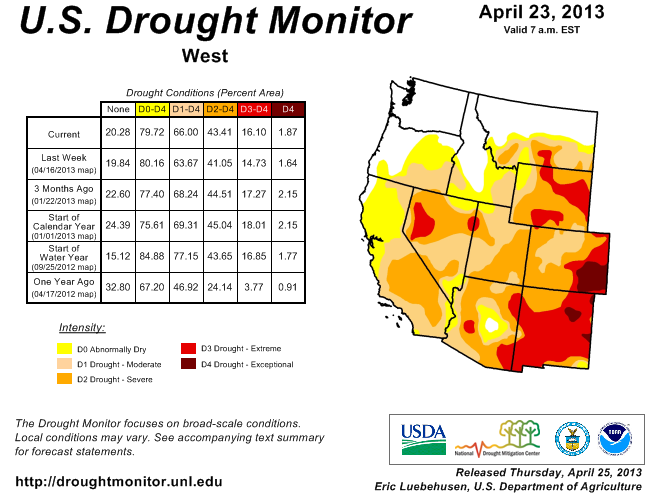 The drought has been especially severe in the nation’s midsection, where some areas are suffering through “exceptional” conditions, according to the U.S. Drought Monitor. To track drought severity, I’ve created a dashboard on this page that shows what percentage of the contiguous United States and the 11 Western states were in various categories of drought. The dashboard allows you to export images like the one below (click to enlarge). The graphics visualize data back to 2000 and show that the current drought in the West is beginning to rival the brutal dry spell that gripped the region in the early 2000s. Just a couple of years ago, very few areas in the West were abnormally dry, but that sure changed in a hurry. Below is the latest map of drought conditions in the region. Although drought is a natural part of the Western climate, the shortage of precipitation has major implications for the region’s water supply, the severity of its upcoming wildfire season, and the health of ecosystems already confronting a broad spectrum of threats. 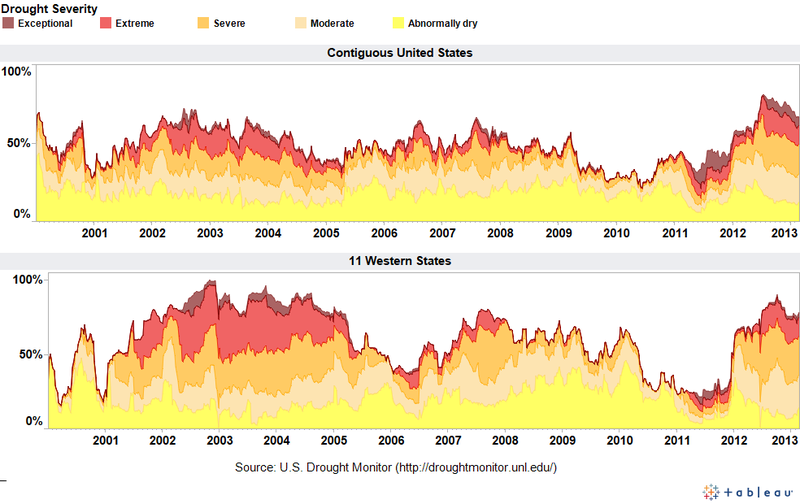 The dashboard is based on the U.S. Drought Monitor, which provides historical data on this page. There are other ways to measure drought, such as the Palmer Index. In a future post, I’ll be sharing some slides that explain the differences in the various measures. National Public Radio has put together an animated series of maps that show how drought conditions have changed over the past few years. It’s also worth checking out how the The New York Times has mapped the drought’s footprint since 1896.